With InstaRead Summaries, you can get the essence of a book in 30 minutes or less. We read every chapter and summarize it in one or two paragraphs so you can get the information contained in the book at a faster rate.Â This is an InstaRead Summary of Daring Greatly: How the Courage to Be... read more Vulnerable Transforms the Way We Live, Love, Parent, and Lead by Brene Brown.Â Below is a preview of the earlier sections of the summary:Â What It Means to Dare GreatlyÂ The author has always been inspired by Theodore Rooseveltâ€™s speech, â€œCitizenship in a Republicâ€. The speech spoke of vulnerability and of trying, even if success is not guaranteed. To the author, this speech is about the reward of trying, not about winning or losing. 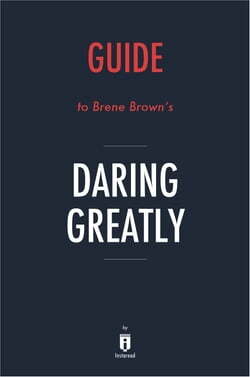 It is for this reason that the author chose the phrase â€œDaring Greatlyâ€ for the title of this book.Â Introduction: My Adventures in the ArenaÂ The author is a social worker who specializes in research. She has previously done extensive research and writing on the topics of shame and living a Wholehearted life, a life filled with courage, engagement, and purpose. In doing this research, the author recognized problems in her own life that prevented her from following her own advice. One of these problems was a fear of being vulnerable. It reached a critical point in 2010 when the author was asked to speak at TEDxHouston, an independently organized event modeled after TED (Technology, Entertainment, and Design), a nonprofit organization devoted to â€œIdeas Worth Spreading.â€ The author gave a speech in which she opened up about her personal life and allowed the audience to interact freely with her. She was surprised by the response she received at the event, and later when her speech was placed on the main TED website. This led to the author making many speeches about vulnerability, and those speeches became this book.